Move over, sea bunnies. The sea sheep are here. This little sea slug - known as the leaf sheep or, more formally, Costasiella kuroshimae - certainly is stunning. 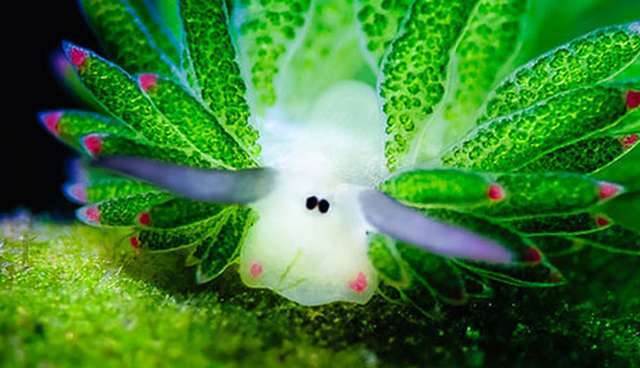 Bearing an uncanny resemblance to a cartoon land sheep, the leaf sheep is a species of sacoglossan sea slug that has the unusual ability to photosynthesize. Leaf sheep retain the chloroplasts from the food they eat and use them to manufacture their own energy - just like a plant would. The process, known as kleptoplasty, is only found in certain sacoglossan sea slugs. While leaf sheep aren't particularly good at photosynthesizing, some species can live for months on photosynthesis alone. The sheep slugs, which are found near Japan, also come in different color variations. This one looks like an artichoke. If you need to see one in motion, here's a handsome leaf sheep roaming across a wide expanse of leaf. As you can see, they're very tiny - only a few millimeters long. It seems the marine slug world is a veritable cache of tiny land animal miniatures; click here to find out more about sea bunnies.